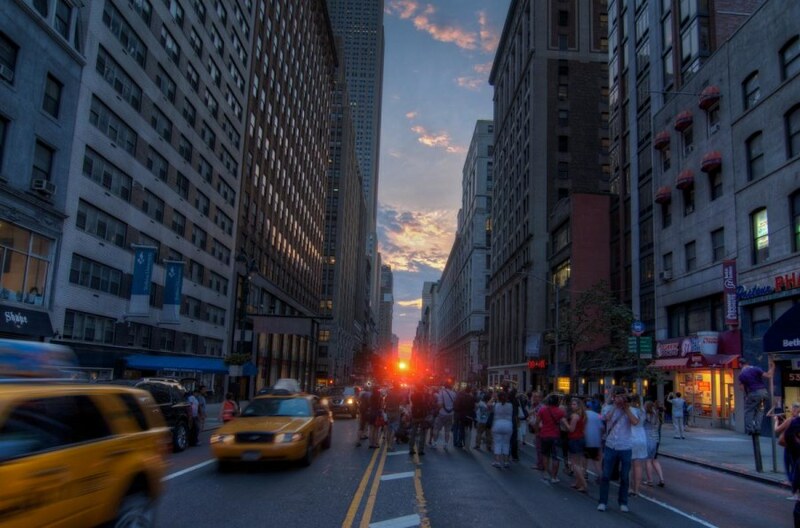 Tonight's showing of New York's hometown celestial alignment, known as Manhattanhenge, was a spectacular success that more than made up for the washout in May. Some of Manhattan's best-known east-west streets — 42nd Street, for instance — were filled with the glow of the setting sun at 8:24 p.m. ET. They were also filled with crowds straining to snap pictures. "When did Manhattanhenge turn into Woodstock?" Brooklyn resident Joe Raskin asked in a Twitter update. 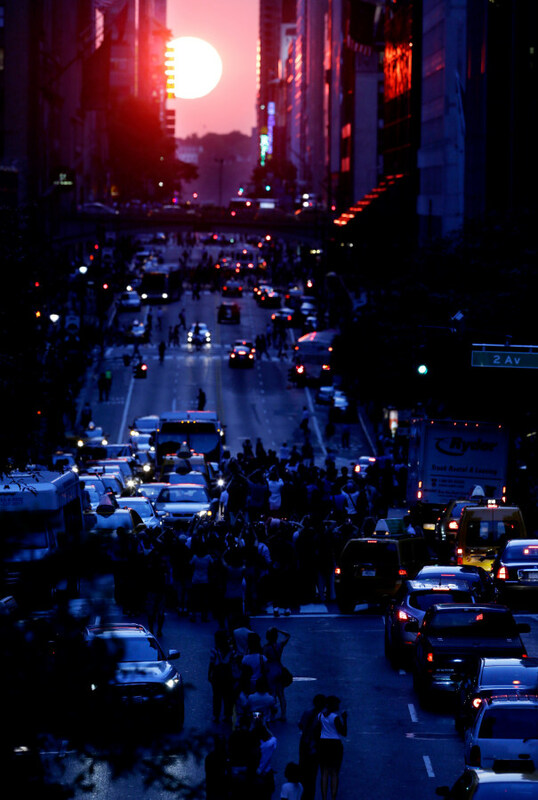 People stand in the middle of 42nd Street as the sun nears the horizon on July 11, 2012. 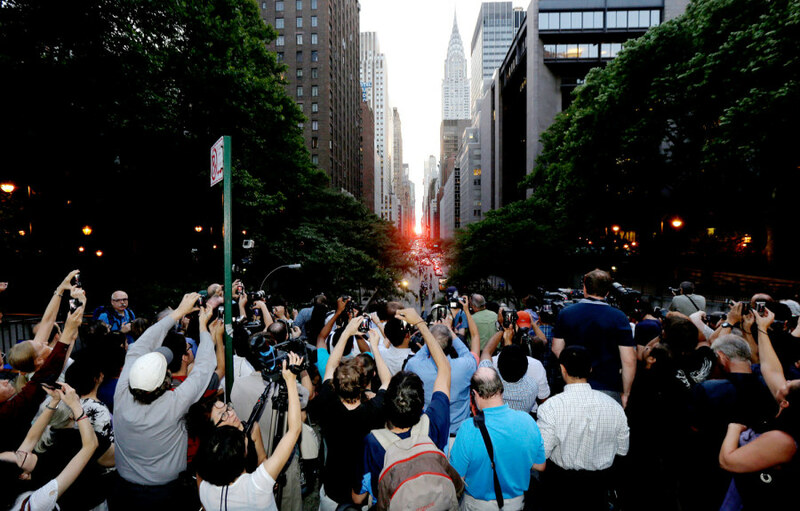 Andy Dallos, a producer for "The Rachel Maddow Show" on MSNBC, documented Manhattanhenge in a series of shots snapped from West 50th Street. Check out The Maddow Blog for more of Dallos' photos. 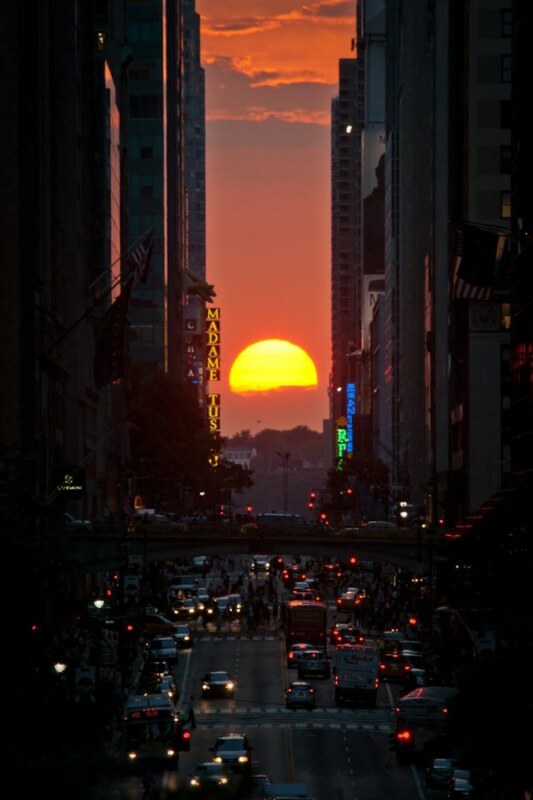 Manhattanhenge occurs when Earth's tilt is just right to have the sun right on the horizon, in line with the orientation of the street grid. That happens twice a year, generally in late May and mid-July. This year, the best viewing times were on May 29 and 30, and again on July 11 and 12. May's opportunity wasn't the greatest, due to clouds and rain. This week, however, the skies have been sunnier, and so have the dispositions of the New Yorkers hoping to get a good view. 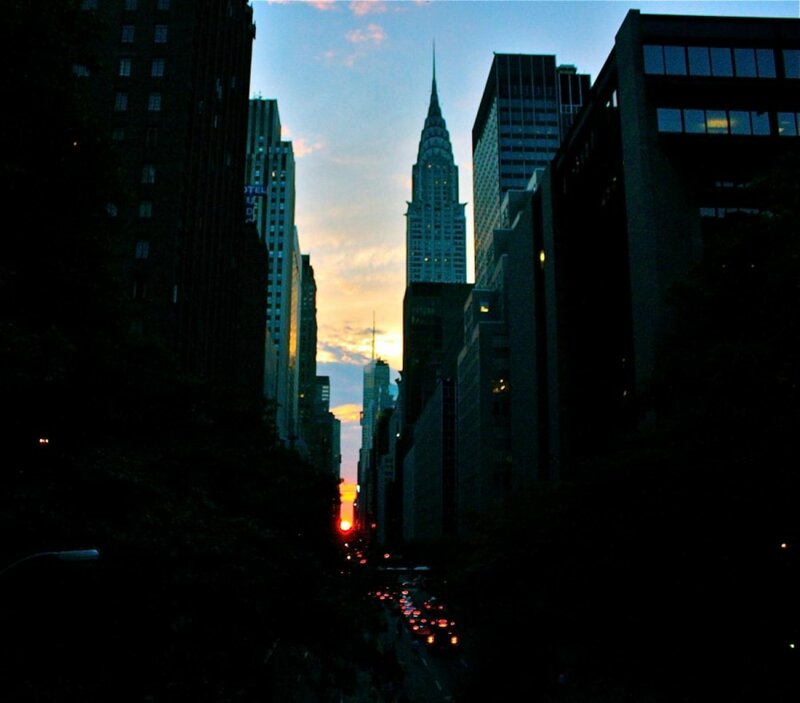 "A Manhattanhenge sun sets, leaving a luminous glow in its wake," photographer Inga Sarda-Sorensen wrote in an oft-retweeted Twitter update. The best news for New Yorkers is that the show replays Thursday at 8:25 p.m. ET, when the sun can be seen as a half-disk sitting on the western horizon. (Remember, don't gaze at the sun for any length of time with unshielded eyes.) Here's a quick viewing guide from Life's Little Mysteries. Did you get a great picture tonight? Share it with us and other msnbc.com users via our FirstPerson upload page. Here's what Chaitanya Kapadia says about this picture: "I had set up on a nice spot right in the middle of 34th Street, between the double yellow lines with a few photographers wanting to get the Empire State Building in my shot. However, I should have anticipated photographers to just swarm the streets when the sun lined up with the grid. Minutes later, the police drove down the middle of the road, getting everyone out, which only meant stepping to the side until they passed you, and then right back. Took this using three exposures hand-held." 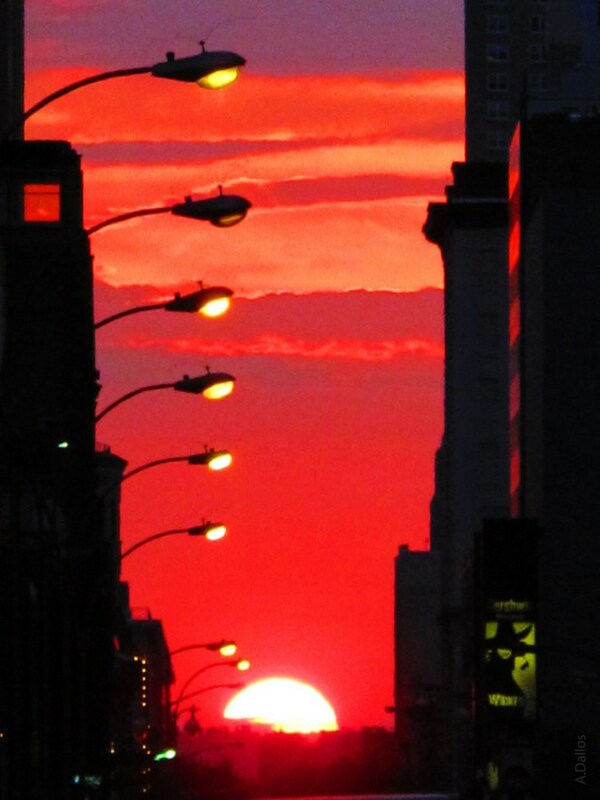 Anne Torres captured Manhattanhenge from Tudor City on July 11. During the setup for the shot, Torres wrote this report: "Spectators begin staking their spots right in the middle of East 42nd Street a little before 8 p.m. Several people behind me who were positioned up on Tudor City can be heard muttering, 'Crazy New Yorkers.'" FirstPerson contributor Paolo Palmero sent in this perfect aligned shot of the sun setting between Manhattan's skyscrapers on July 11.